TENS Pros Ultra Premium® TENS Pro-stim Electrodes 2.0" Round, White Cloth, Carbon Layered, TYCO Gel, Reusable electrodes. Premium White Cloth-Mesh backing is comfortable, durable and safe. These electrodes are an excellent quality and price. They stick really well and are long-lasting. I highly recommend them. My device was not listed but I tried them anyway, they work fine on this unit, they are made very well the gellis very sticky and stays attached to my back. I just use a little water to clean them off when needed, eventually I just use new onesm the cost is very reasonable compared to local places that sold the pads. Getting ready to order more. Very good product. Well made, and reasonably priced. Very happy with them. Great company and very happy with their products!! Thank you very much. VERY pleased with this product. I need my TENS often and these electrode pads work on my knees. These Electrodes Saved the day!! I have an OLD Tens machine, so when I re-injured my back recently, I had no Electrode pads to use. Finding a product that would work on my unit was a real blessing. Thanks for offering this product; it is exactly what I needed. Q: How many pads in the pack for $2.95? 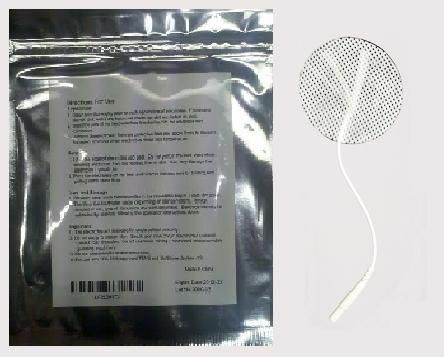 Each pack of electrodes contains four (4) individual pads. Q: How many electrodes in package? Unless otherwise stated, all of our electrode pads come 4x per pack, as listed in the product description. Q: Are these electrodes comparable to the 199650-001 for the Empi Select TENS machine ? Yes, these electrodes are the same size and shape, and have the same industry-standard, 2mm pin-style female connector for where the lead wires plug into. Q: Does this fit socket conn. 0.080 in. (2.03mm)? Yes, all of our electrodes with pigtail ends have the same industry-standard 2mm diameter female pin-style connection for where the lead wires plug in into.